I began the morning at Noccalula Falls Park in northeast Alabama. Bobby, a park worker, was the only one at the 250 acre facility when I arrived. A petting zoo and miniature golf course stood to the left of the entrance while a pioneer village, lit with Christmas lights, lured me to the right. The winter attraction was clearly the replica 1863 C. P. Huntington train ride through the festive village, not the waterfall tumbling into Black Creek Gorge. 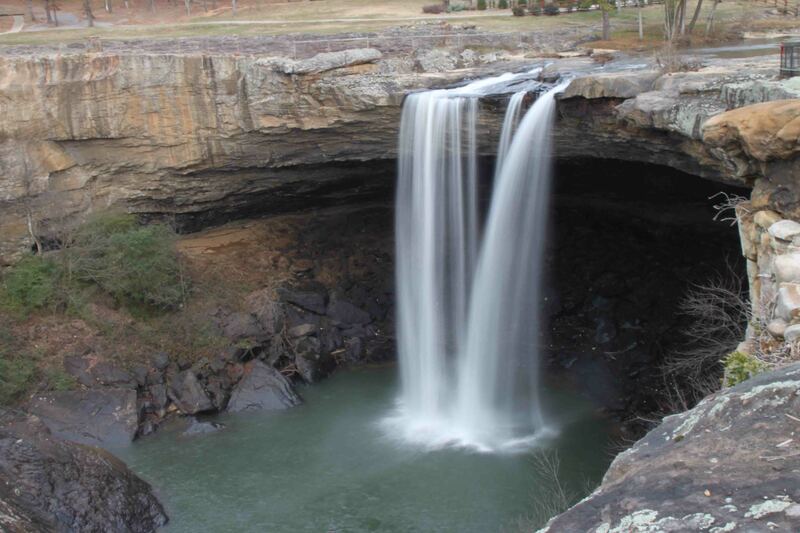 Legend has it that Noccalula Falls, once called Black Creek Falls, is named after the Cherokee princess who chose to leap to her death rather than marry a man she didn’t love. After visiting the falls, I traveled northeast to Little River Canyon. The drive winds along the Canyon’s edge while the Little River twists along the canyon floor some 700 feet below. The canyon is one of the deepest east of the Mississippi. Lookouts provide dramatic views of sandstone cliffs towering above tantalizing, emerald green waters carving through the canyon floor. After stopping a few times to admire the tremendous landscape, we pushed forward to DeSoto State Park. At DeSoto State Park, the water of DeSoto Falls plunges 120 feet into the river below. The falls, the highest in the area, was named for the Spaniard, Hernando DeSoto, who unsuccessfully searched for gold nearby. The park, close to the border of Alabama and Georgia, also features a lovely reservoir situated above the falls. The scenic drive along Lookout Mountain Parkway continues northeast into Georgia. While I had attempted to find a cache along Lookout Mountain Parkway, each time I stopped the cache was over a mile away, or I didn’t have cell service. Knowing that an entire series of caches were hidden along the parkway and aptly name LMPN or LMPS (Lookout Mountain Parkway North or South, respectively) with an associated number (1-20), I started to get frustrated that I couldn’t find one! I should have had twenty by now! I finally stopped off at a park in the City of Mentone to look for a bison tube, but after ten minutes of waiting out a muggle, I moved on. in order to get my cache in each state, I had to detour off the parkway and go west before I eventually crossed into Georgia. Finally, I came upon a cache named “Guardian Angel”. The cache owner placed an ammo can nearby the church at which they attend service in memory of Brittany (a 15 month old) that passed away 14 years ago. Brittany is the cache owner’s son’s heart donor, thus the guardian angel theme. A guardian angel watches over the cache. It was so touching. I’ve never found a cache like this one, and I’m glad I didn’t find any on Lookout Mountain Parkway, or I would have never found this one, my first in Alabama. Just another reason why I like geocaching. We made one more stop before turning to the northwest for a three and a half hour drive through Tennessee to Hopkinsville, Kentucky, the beginning of our next scenic drive. Our last stop was at Cloudland Canyon State Park. We took a 1.2 mile hike, mostly down metal grate stairs, which the dogs despised, and of course back up. Fellow hikers, winded from the climb up, prepared me for the worst as the dogs and I stepped down one stair at a time. We walked to two falls, both of which I loved, as the cold air had caused the splashing water near the base of the falls to turn to ice. Oh my gosh. I loved the water and ice falls. Needless to say, that is my picture of the day. It was a waterfall day! I got behind on my reading… Enjoyed the pictures and stories as always! I got behind on my blogging so we’re even!